Here we go folks, my first chance to film the MSAC monthly meetings. I wasn't allowed to set-up my gear ahead of time so the first ten minutes are absent. During that time the commission approved the minutes from the Jan. 2013 meeting, read through list of suspended fighters from the events held since the last meeting, and brought the fighter, Josh Mellen, to the table to answer some questions about his abilities to fight in the cage. Josh was most of the way through his explanation when I finally could begin capturing it on video. There is an audio recording that the Commission makes themselves at each meeting. We will be sharing those recordings with you in time. I will re-edit this footage to include the audio portion that is missing as soon as it becomes available. Enjoy and be sure to check in around the second Thursday of each month for the next video. 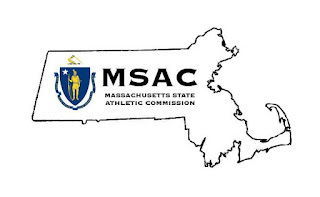 WesternMassMMA.com wishes to thank it's generous sponsors who make it possible to attend these meetings by providing us with the resources necessary to travel and maintain close professional contacts within the Commonwealth and throughout New England. PremierFC, WarriorNationXFA, New England Fights, WCMMA, BJJHQ, Coliseum To The Cage, and the folks that provide us with invaluable insight into the sport and the community such as Gabriel Gladiator Santos and Kevin "The Ref" MacDonald. I'd also like to thank the local community access station in Deerfield, MA that makes my dreams of producing fight videos and other projects a reality.